In 2010, I created SimbaSpot as an outlet for my creativity, and as a way to honor my cats, who are the greatest source of affection and inspiration I've ever had. My first feline, Simba, is the namesake of this site, but when he passed in 2006, his "Circle of Life" heir is my current muse. Bailey was born the exact day of Simba's passing, and is so the same, yet, so different. Anyway...in the passing years, I have embodied each of the cats who have crossed my path over the years... and Bailey's avatar has become: "Bailey FlatCat" and this way he can go anywhere a dog might be able to... and perhaps even a few more locales. Travel with me and Bailey FlatCat. 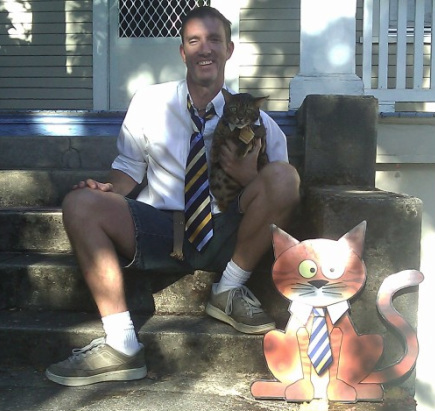 Me in a tie, real Bailey in a tie and Bailey FlatCat in a tie. Before we begin this photo journey, we start with the photo above, in which the three of us (left-to-right, in case you need clarification, are: myself, the actual Bailey cat, and Bailey FlatCat,) are sporting the fraternity-esque necktie that best defines my Bailey buddy.